"Where to this Saturday?" This is what everyone asked every week. Well, last week, I thought of doing something different. I looked through the maps provided by Malsingmaps (thank you MalsingMaps... :-) to look for MTB tracks, hash or bash. I printed a copy of each of the maps and showed it to the geeks on Saturday, the day of our hash. We met up at the Rumah Ku restaurant, but it was closed during the Puasa month. So we adjourned to one of the coffee shop in Jalan Bahagia, we called "London Fried Rice" coffee shop. During breakfast, we unanimously decided to go to the Bukit Cahaya trails next to Kayangan Heights. Malsingmaps' map of the Bukit Cahaya Trail. When we reached Bukit Cahaya, we were disappointed. The trails as indicated in the maps had given way to housing developments. So we decided to move on to the next trail, the Puncak Perdana Trail. Driving along the Puncak Alam road, we could not locate the start of the trail as indicated in the map. So we decided to move on to the next one on the list, the Empangan Subang trails. Malsingmaps' map of the Empangan Subang Trail. After driving along Jalan Seri Jaya, we could not locate the trail either. Joe the Oracle managed to consult his GPS device and we managed to locate what was an entrance to a house as the start of the trail. We believed that the trails were long gone and that the maps needed updating... LOL. After spending the better part of the morning searching for trails, we decided to give up on our search and to head for the Rubber Research Institute for some cycling time! On our way out, we managed to spot the entrance to the Puncak Perdana trails... or so we thought... :-) So we doubled back and parked in the car park next to UiTM. At that point we were just dying to get out and ride.... LOL. 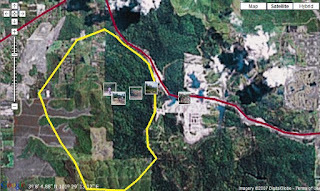 Malsingmaps's map of the Puncak Perdana Trail. We set out from the UiTM car park and rode to the "entrance" of the trail, which lead to a steep hill with loose rocks making it a difficult climb. Overall, the Puncak Perdana trail was littered with land slide covering parts of the trail. The trail had turned into a cow herding trail with cow dung deposits along it. At certain parts, there were blue coloured spent shotgun shells. Also, we discovered that half of the land area designated as Puncak Perdana had been converted into a residential development project. Google Maps' satellite view of Puncak Perdana. Further along the way, we encountered dead ends upon dead ends. We tried to cut through the brushes and undergrowths unsuccessfully using tree branches as "hatchet". The undergrowths were thick and has completely covered and hidden the trail. The trail was a "botak" trail. We were cycling directly under the hot sun. The ride took a lot out of us and after unsuccessfully trying to find any ridable trail, we decided that we had enough and decided to head back.